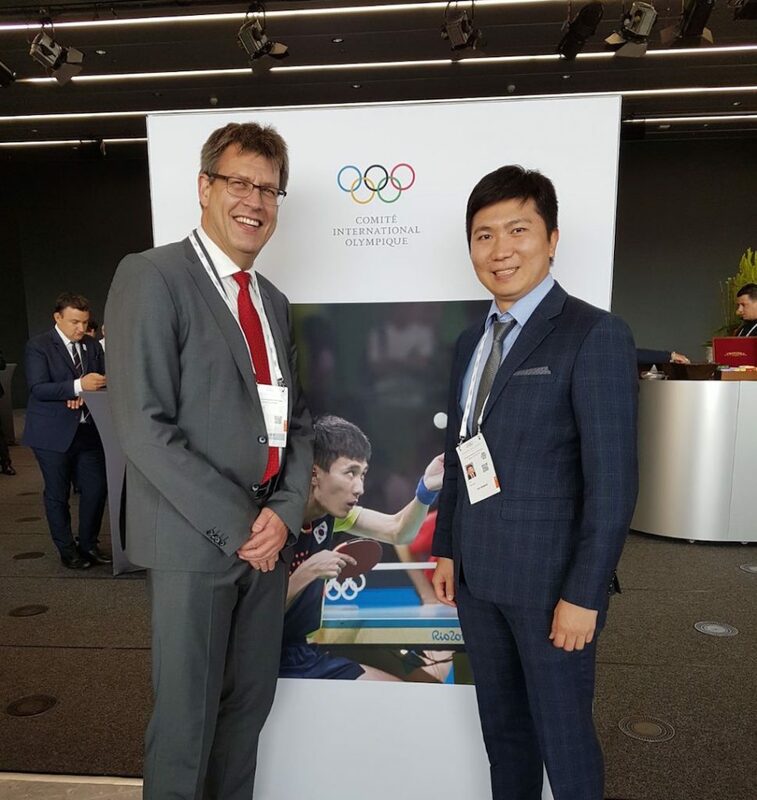 Present at the 130th IOC Session in Lausanne on Tuesday 11th and Wednesday 12th July 2017, ITTF President Thomas Weikert and Director of Olympic Games, Raul Calin welcomed the decision of the International Olympic Committee (IOC) to award both the Olympic Games 2024 and 2028 at the same time. From Left to Right:Thomas Weikert ( ITTF President), Eric Garcetti (Mayor of Los Angeles), Gene Sykes (CEO of LA 2024) and Raul Calin (ITTF Director of Olympic Games). ITTF had a strong presence as Thomas Weikert and Raul Calin interacted with the mayors of both bid cities. 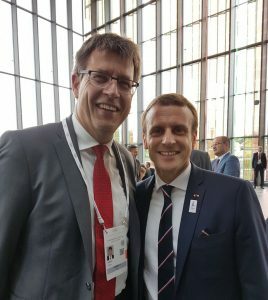 They had important discussions with Anne Hidalgo, Mayor of Paris and Eric Garcetti, Mayor of Los Angeles, and even had a brief introduction with the French President Emmanuel Macron. In the session, both cities present their outstanding presentations at the 2024 Candidate City Briefing and the dilemma of awarding the 2024 Olympic Games to either Los Angeles or Paris was solved. The IOC concluded that it would be a historical mistake to lose any one of these strong bids, and thus decided to announce host cities for both Olympic Games 2024 and 2028 during the 131st session of the IOC in Lima, Peru in September 2017. In 2014, the IOC adopted the Agenda 2020 which is a strategic roadmap for the future of the Olympic movement, and both Los Angeles and Paris comply to the recommendations mentioned in it. “We have seen that the two candidate cities very much followed the so called Agenda 2020. That means using venues which are still existing and emphasizing environmental necessities. Both cities also have great facilities for table tennis. – Thomas Weikert. Both Weikert and Calin also exchanged ideas about the mixed doubles and Tokyo 2020 Games with Ryu Seungmin, the first table tennis IOC member. The focus on the 2024 and 2028 host city election process took most of the attention, but it was also important to remark the discussions held about the urgent need to act on the ethics area. One of the many ideas discussed was to provide more independence to the IOC Ethics Commission. “Independence is important to ensure the Ethics Commission can work properly. ITTF has just adopted its Ethic Code on 1st July, but certainly we will monitor the implementation and we will be ready to adapt as necessary. We know it is not a perfect code, but it was a necessary start.” – Thomas Weikert. Overall, it was a very positive IOC Session, in which ITTF representatives interacted with many IOC members, Presidents and Secretary Generals of various other International Federations and the representatives of the two candidate cities.